Thanks for stopping by! 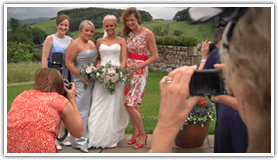 I’m Pete and I’m an experienced wedding videographer based in the heart of West Yorkshire’s Bronte Country. 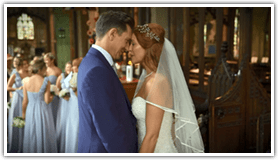 I have well over a decade in the wedding business creating stylish wedding videos throughout Yorkshire, the North of England and beyond. I offer a totally relaxed, unobtrusive filming style using the latest professional equipment, capturing your big day to perfection. My background in creative documentary means that I have the skills to film your big day as naturally as it happens. Nothing is staged, nothing is posed and nothing is faked – your big day is filmed as naturally as possible with the minimum of fuss. Couples are understandably nervous at the prospect of being filmed, however my discreet filming style ensures for most of the day you would not even know I was there! 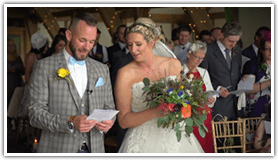 Charlotte and Andrew – Rudding Park, Harrogate – October 2018 – Check out their trailer below. Check out my unbroken 5 star Facebook Reviews from just some of my happy couples HERE! Although based in Yorkshire I can film weddings across the country and abroad, have a look at my prices and contact me for a travel quotation. 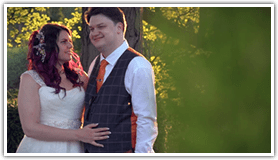 I think you will find my prices very competitive compared with other companies offering similar, high quality wedding films. 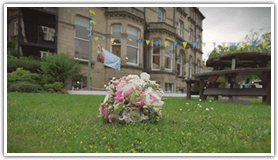 Over the years I have regularly filmed weddings in and around Leeds, Bradford, Wakefield, Skipton and The Yorkshire Dales, Ilkley, Huddersfield, Halifax, Otley, Harrogate, York, Wetherby, Scarborough and Whitby, Clitheroe, Hull and Humberside, Keighley, Ripon and across the Craven District. 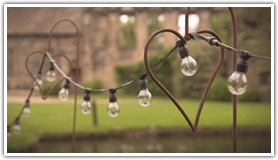 I am ideally placed to film weddings in Yorkshire, Lancashire, Cheshire, Derbyshire, County Durham and beyond. 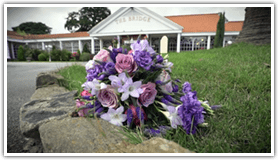 Contact me today for details of how we can provide for you a lasting memory of your special day. 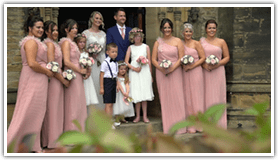 Wedding videography across the north of England and beyond. The Coniston Hotel near Skipton, Middleton Lodge near Darlington, Wooley Hall in Wakefield, Allerton Castle in Knaresborough, The Hospitium in York, Cubley Hall in Penistone, Rudding Park in Harrogate, The Priory Cottages & Barn near Wetherby, Rogerthorpe Manor near Pontefract, Hazlewood Castle between Leeds and York, Falcon Manor in Settle, The Parsonage Hotel in Escrick, near York, The Majestic Hotel in Harrogate, Ripley Castle, The Priory at Bolton Abbey, The Mercure Hotel in Bingley, Bolton Castle in Leyburn, The Bridge Hotel near Wetherby, Oulton Hall near Leeds, Wentrbidge House near Pontefract, Bagden Hall in Denby Dale, Bertie’s in Elland, St Mary’s Cathedral in Leeds, Swinton Park in Masham, Carlton Towers near Leeds, Hornington Manor near York, The Woodlands Hotel in Leeds, Mitton Hall near Clitheroe, Eaves Hall near Clitheroe, Ribby Hall Village near Preston, Hoyle Court in Baildon… and more Churches than I care to mention!